Montana is home to beautiful skies, majestic mountains and gorgeous sunsets. Yet, not all of Montana’s beauty is above ground; many delightful and valuable things can be found below the surface of the earth. Fossils and artifacts reveal fascinating tidbits of life long ago. Like gold and sapphires, rocks and minerals can be as intriguing as they are valuable. The potential to find something valuable in our mountains is especially enticing. But, what tools are needed to collect the treasures of the earth? A steel tool with a flat hammer on one end and either a pointed pick or chisel face on the other, the rock hammer is a valuable tool for freeing a specimen from the host rock or for cracking it open to reveal the inside. The rock chisel allows for a more precise extraction or a finer removal of matrix and is useful for splitting sandstone or shale. Safety goggles are must have protection for the eyes when using either a rock pick or chisel, as rock chips can splinter and fly in unpredictable ways. Flexible plastic sides are recommended. A small, portable magnifier, the magnifying loupe aids in identification and reveals finer crystalline structures. 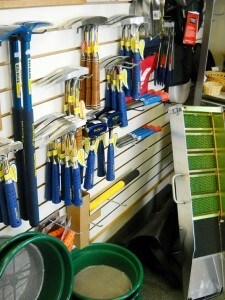 A foldable shovel is critical if quantities of soil need to be removed. Gloves provide protection from sharp crystals and minerals. A streak plate is a small, white, inexpensive tile used to identify minerals. A penny and a pocketknife are used to test mineral hardness. A toothbrush is useful when gentleness is needed to reveal a fossil or mineral. A classifier screen is beneficial for sifting for sapphires or garnets and when panning for gold. A backpack should be strong enough to carry the tools and supplies, as well as what is found. Some form of packing material – newspaper, bubble wrap, egg cartons, pill bottles, etc. – should be included to protect and cushion finds. Other essentials include water, food, sunscreen and a first aid kit. A visit to a local rock shop can also be helpful. Here, you will not only find many of the items listed above, but samples of the treasures you are hoping to find. Ask to see what your treasure looks like in the rough. Many times when searching, it is the host rock, or matrix, that will be recognized and thus determine a spot to explore further. Another valuable resource is the Bozeman Gem and Mineral Club. They know most of the local minerals and have years of rockhounding experience. Going with them on one of their field trips can be invaluable. Well-stocked with maps and books on where to go and what to find, Earth’s Treasures is your local rock shop. Come in to visit our knowledgeable staff and to see Montana minerals, crystals and fossils and other treasures from around the world. Earth’s Treasures is located at 25 N. Willson, in historic downtown Bozeman. 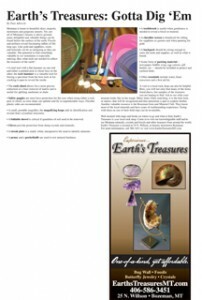 For more information, call 586-3451 or visit www.EarthsTreasuresMT.com.